Having established in our last entry that for nearly four decades John Lennon's white 1965 Phantom V Rolls-Royce, chassis No. 5VD63, has been in the possession of the Klein family and is currently being faithfully restored, it remains for us to dispel some of the confusion concerning the real identity and history of a notable impostor. In January this year, self-made multi-millionaire and real estate developer, Stephen Tebo made international headlines when he acquired the historic Cadillac hearse that transported President Kennedy's body from Dallas Parkland Memorial Hospital to the airport in November 1963. Virually every news item that reported this latest addition to the Tebo Auto Collection also made mention of “a 1965 Rolls-Royce custom made for John Lennon” that resides among the 400 other cars in his collection. When and wherever the Tebo Rolls is put on show, a well known photo of The Beatles in 1969 beside Lennon's genuine Phantom V is proudly displayed. The juxtaposition of the sign with the impressive white limousine is intended to convince the spectator that this is indeed the same car as the one in the “Ballad of John & Yoko” video. Visitors to the Tebo Auto Collection are left with no doubt that they have seen at close quarters the very car that John Lennon and Yoko Ono travelled everywhere in during the late 1960s. Leaving aside the fact that we know for sure that the authentic John Lennon white Phantom V, chassis No. 5VD63, has never left England and that it has been in the Klein family at least the last 35 years, let's take a closer look at Tebo's Rolls-Royce. The next most apparent difference is the interior upholstery and carpeting. Immediately after purchasing 5VD63 in 1966, John Lennon spent a small fortune by totally transforming the exterior from black to white and replacing the interior furnishings with white carpets and fabric. In addition, tinted polarized glass windows, mobile telephone and 8-track stereo system were installed. A glance inside Tebo's Rolls-Royce tells you that either someone has stripped all of Lennon's custom modifications or that this is not the same car. The interior of Tebo's Rolls-Royce is beige. In contrast, Lennon's Phantom V has white carpet and fabric front and back. And where has the distinctive antenna on the roof of the real white Phantom V gone? The Tebo Auto Collection Rolls appears to have only a standard radio aerial behind the right side wing mirror. As is clear, the antenna on Lennon's Rolls (right) is missing on Tebo's car. Another obvious difference is the size of the two air vents at the front of both vehicles. Stephen Tebo's Phantom has narrow, standard air inlets whereas, in the late 1960s, Lennon added a pair of large intakes directly beneath the quad headlamps. Tebo's car lacks the custom air intakes on Lennon's Rolls (right). One of the rarest features of Lennon's 5VD63 is the white steering wheel. It is probably the only Phantom V which has one, the rest would have been black. The Tebo Rolls-Royce (left) has a standard black steering wheel. Somewhat eccentrically, Lennon insisted that his Phantom V was fitted with a custom white steering wheel (right). Then there is the fact that someone has painted John Lennon's signature on the driver's side door of the Tebo Auto Collection's Phantom V.
Why would anyone feel the necessity do this, unless it is meant to further convince the public that this was Lennon's car? Isn't this a bit like an art forger copying the signature of an old master? The most important distinctions between Tebo's Rolls-Royce and the original white Rolls owned by the Klein family are not visible without a detailed inspection. These are the manufacturer's ID numbers for the chassis, the engine and the body. The serial numbers for John Lennon's white 1965 Phantom V are: Chassis No. 5VD63; Engine No. D31PV; Body No. V.327/20076. Our research convinces us that the serial numbers for the Phantom V in the Tebo Auto Collection are: Chassis No. 5LVD15; Engine No. D7PV; Body No. 20062. The coachwork of both vehicles was made by Mulliner Park Ward, Design No. 2003. The Rolls-Royce in the Tebo Auto Collection was completed in June 1964, not 1965 as is always stated. One can only assume that this confusion is intentional, as it is public knowledge that the black Phantom V that John Lennon bought second-hand in 1966 was first delivered to Patrick Barthropp Ltd. in May 1965. The original owner of Mr. Tebo's 1964 Phantom was Ben B. Bodne. 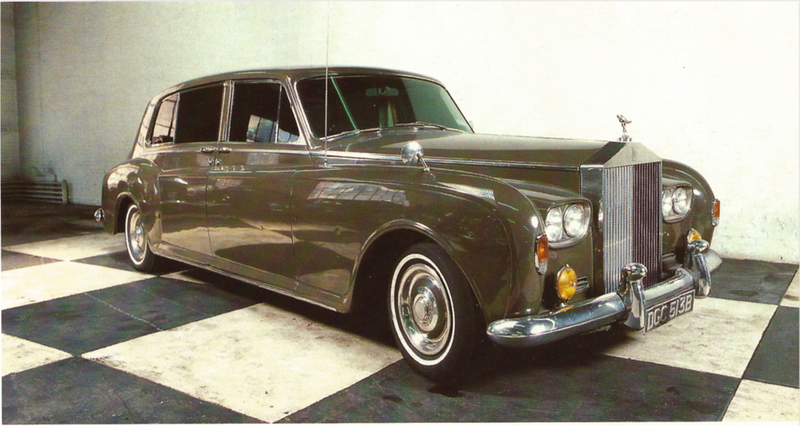 Proprietor of one of New York's most prestigious old hotels, The Algonquin, Bodne took possession of his left-hand drive, latest model Rolls-Royce Phantom V (pictured above) in 1964. Its original color was sable brown with matching interior. Until the late-1970s, Bodne's giant Phantom would have been a familiar sight cruising through New York's theatre district, or parked outside the entrance to the Algonquin. Exactly when and how its next owner acquired it has not yet been established, but Yoko Ono presumably bought Bodne's brown Phantom some time after John Lennon's assassination, probably around 1981-82. As executor of her deceased husband's estate, Yoko decided to auction over 100 items in her possession though Sotheby's in New York on June 23, 1984. (Click on the link to see "For Sale: John and Yoko," Evening Independent (Ann Kolson) 26 June 1984. Go to page 4). The last lot to be sold was her beautiful sable brown Rolls-Royce. An unidentified woman and a phone bidder pushed the auction price past the reserve of $100,000 to $184,250, the proceeds going to Yoko Ono's children's charity, The Spirit Foundation. It must be said that she did nothing to correct news reports before and after the sale that her brown Phantom V was a “1965” model and that it had belonged, not just to her, but to “John and Yoko.” The long distance telephone buyer who outbid all other rivals was a shopping mall developer based in Pensacola, Florida. A long-time Beatles fan with an impressive collection Napoleonic memorabilia, Wallace C. Yost was nothing if not ambitious. At the height of his career he employed over 200 people and owned Mariner Mall shopping centers in Pensacola, Fort Walton Beach, Crestview and Panama City, with a luxurious home in Gulf Breeze. At some point, perhaps in the late 1980s, Yost ordered his sable brown Rolls-Royce to be re-painted and re-upholstered to resemble John Lennon's famous limo. For a year or two, his imitation Lennon Rolls was put on display in the Mariner Mall as a public attraction until, that is, he went into hiding owing his creditors over $44 million. As FBI agents began a six-year hunt for the absconder, his re-painted Rolls-Royce was acquired by the banks and promptly auctioned off. In 1997, Wallace Yost was captured and sentenced to 18 months jail. After having passed through several auction houses, his now white Phantom V went under the hammer at a Barrett-Jackson auction in January 1999 for $118,000. The buyer was Stephen Tebo. Though advertised by Barrett-Jackson as coming with all the necessary documentation, in fact there was no actual provenance proving that the car had once belonged to John Lennon, as the catalogue implied. The honest Mr. Tebo had made an honest mistake and found himself the owner of a convincing fake. While it gives us no pleasure whatsoever to debunk Mr. Tebo's claim to be the owner of one of the most famous limousines in rock music history, we believe we have a public duty to do so. John Lennon gave the world so much of himself through his music and his public anti-war demonstrations--for which he paid the ultimate price--that any form of counterfeit activity involving his name and image is simply wrong. Should Mr. Tebo or anyone else wish to provide proof that any the assertions published in this blog are inaccurate, we would be only too willing to correct our research and publish a sincere apology. Hello jebs1911. Thanks for your question. Which one? I understand there are two white Rolls Royces in Pensacola that the owners claim belonged to Lennon once upon a time... the only way to verify the authenticity of these claims is to check the manufacturer's serial numbers. The famous white Rolls Royce Phantom V that John & Yoko and The Beatles used in the late-1960s carries the following numbers: Chassis No. 5VD63; Engine No. D31PV; Body No. V.327/20076. I can assure you that Jody Klein is the owner of the vehicle in question. Your friend should be content to be the owner of a Phantom V which is an awesome thing in itself - he can still boast that he has a car that closely resembles the one owned by John Lennon. I think it is important to note that the car within Stephen Tebo's collection is in a private collection, not for public display. Whatever he chooses to have in his collection, or have pictures of in his collection is his personal business. I researched Stephen Tebo on the web and it appears that he uses his private collection to raise lots of money for charities in his community. Also, it looks like he has donated millions of dollars for a cancer center. So, does it really matter that this car may or may not be the same Lennon Rolls? After all, it was owned by the estate of John Lennon. Lennon's legacy isn't within a verifiable vehicle, but what he represented. I don't think he would mind now if he knew that a "counterfeit" vehicle was raising millions for charity.